Minus 7 but sunny and calm. A beautiful day for late fall. I parked on Danesbury Ave. just west of the Allen Expressway. 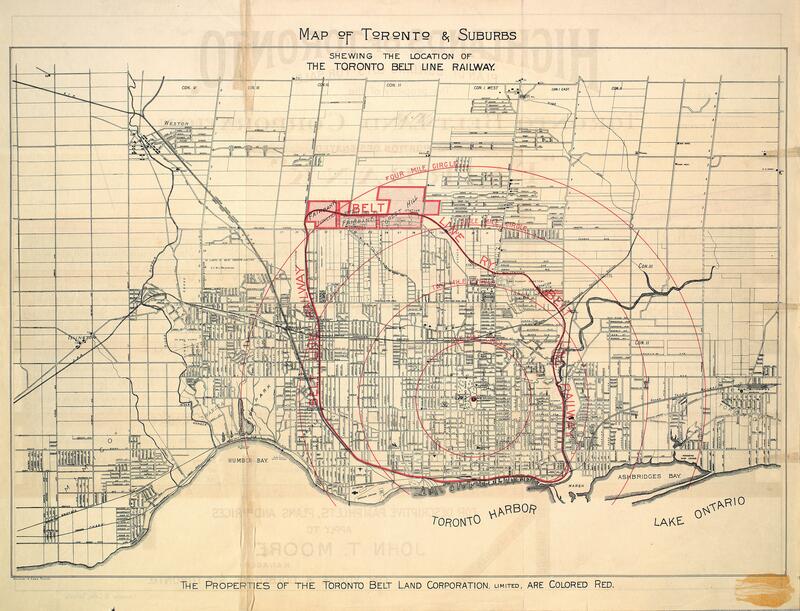 By the 1890’s Toronto had filled most of the vacant land inside it’s existing borders. Access to areas to the north was not easy as many of today’s bridges didn’t yet exist. A lengthy trip up and down steep ravines left the areas undesirable and eliminated any chance of commuting downtown for work. Sir James David Edgar developed a plan. He started to accumulate large tracts of land for new development. The plan was complete with a commuter railway to service the population. In 1889 he set about building the Beltline Railway that was to become a 40 km loop around the edges of the city. The Toronto Belt Land Corporation was set up to sell lots to home buyers. By 1892 the loop had been completed including 44 stations. Some of these were built on a grand scale like the Moore Park station while other stops would have been a whistle stop, more like an early version of a bus shelter. Of these stations only the Don Station survives having been moved to Roundhouse Park at the foot of the C.N. Tower. Unfortunately for Edgar a recession hit and the housing market crashed. The lands sat undeveloped and the passengers he envisioned never showed up. At 5 cents per station the fare was equal to $1.00 per station today. This also contributed to the early demise of the railway. After only 28 months passenger service had ended. Following the collapse of his railway and land speculation scheme James Edgar was undaunted. He went on to serve as a railway critic for the Liberal government. Elected in 1884 he became the 7th speaker of the house in 1896. The map below is from 1892 and shows the belt line railway and the land outlined in red near the top where Edgar planned his subdivisions. The rail line was used in various ways over the next 100 years. The section through the area of land speculation has become industrial along the rail corridor and it served the factories into the late 1980’s. A large part of the former rail line has now been converted into a 9 km trail system that exists in 3 separate sections. The Ravine Beltline Trail, which runs through Mud Creek Ravine south of Mount Pleasant Cemetery and past the Don Valley Brick Works, is the most southerly portion. The section from Mount Pleasant through to Allen road is the longest and is known as the Kay Gardner Beltline Park. When Allen road was built the rail line right of way was expropriated. The section west of here is known as the York Beltline Trail. This was the target of this shorter walk and the area of land speculation. As you enter the trail off of Roselawn Ave. at Geograd Gardens the trail is maintained to the right but not to the left. Here it runs down to the back of the apartment buildings toward Allen road. Someone has built a cat colony behind the factories down here. I saw three of the locals but there is room for a half a dozen or more. 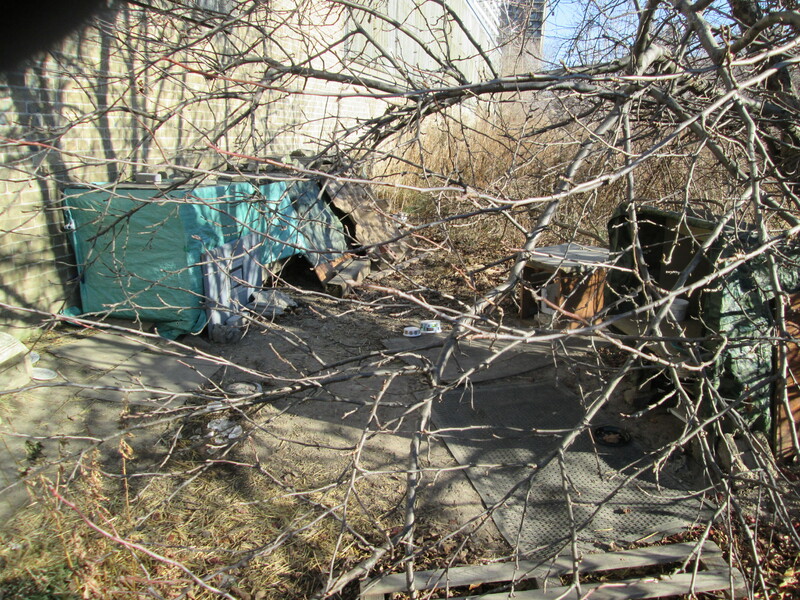 The white and grey cat in the cover photo is on the ground here behind the green cat condo. 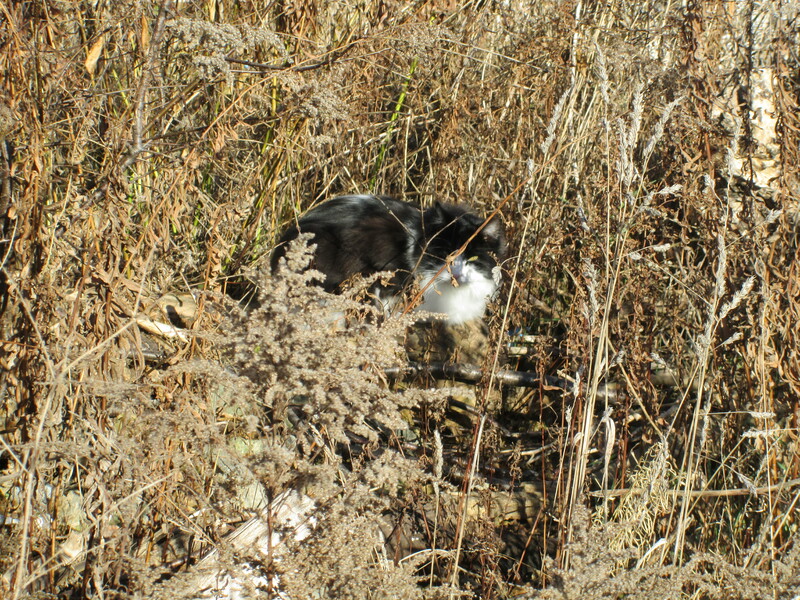 This black and white kitty was enjoying a sunny afternoon and keeping a close eye on me. Either I had food, could be ignored or needed to be ran away from. In typical cat fashion, I was ignored. Two original bridges remain from the railway. 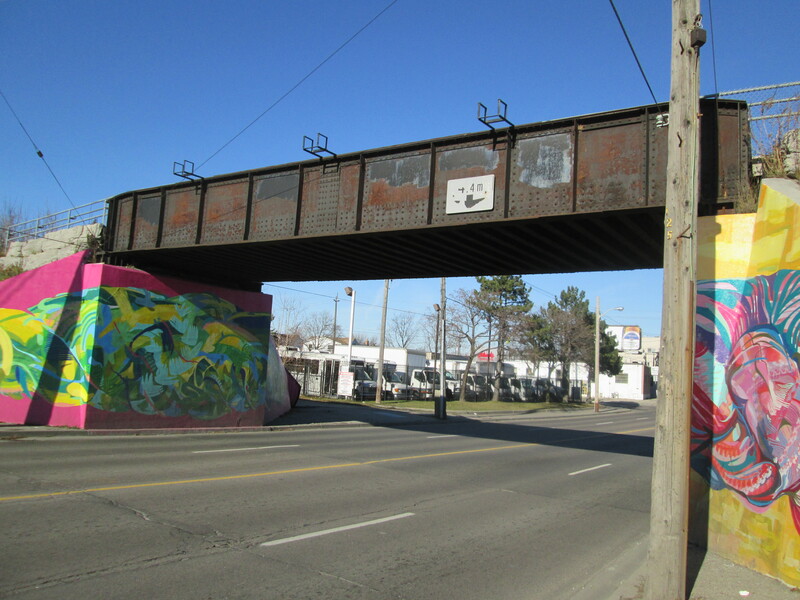 The trail crosses Dufferin Street on the rail line’s original bridge. This bridge, along with the Yonge street bridge, are a lasting reminder of the rail industry in the last part of the 19th century. Here we see a steel bridge on concrete abutments. Based on the construction of the Yonge street bridge it is likely that the abutments were originally cut blocks of stone. The concrete may have been added for restoration purposes. 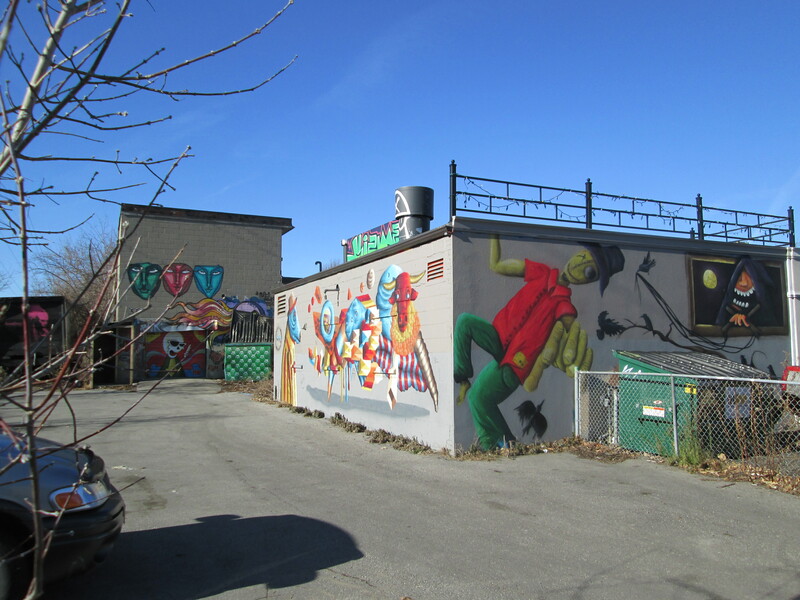 Near Fairbank Road a couple of the industrial buildings have been the canvas for a painter. This appears to be too good to have been done by a random graffiti artist. Perhaps this is the way to deter them. Metro Sportswear Limited was founded in 1957 by a Polish immigrant named Sam Tick. In 1985 it started calling it’s down filled jackets by the name Snow Goose. When they expanded into Europe in the early 1990’s that name was taken and so Canada Goose was born. The smoke stack on the left of the power transmission tower is at Canada Goose’s factory on Bowie street. Here the trail ends. The Beltline track ran up beside the Grand Trunk Railway and joined it for the trip back to Union Station.. The Grand Trunk went bankrupt and was absorbed by the government into the Canadian National Railway in Jan. 1923. CN railways operated this section up until 1988. 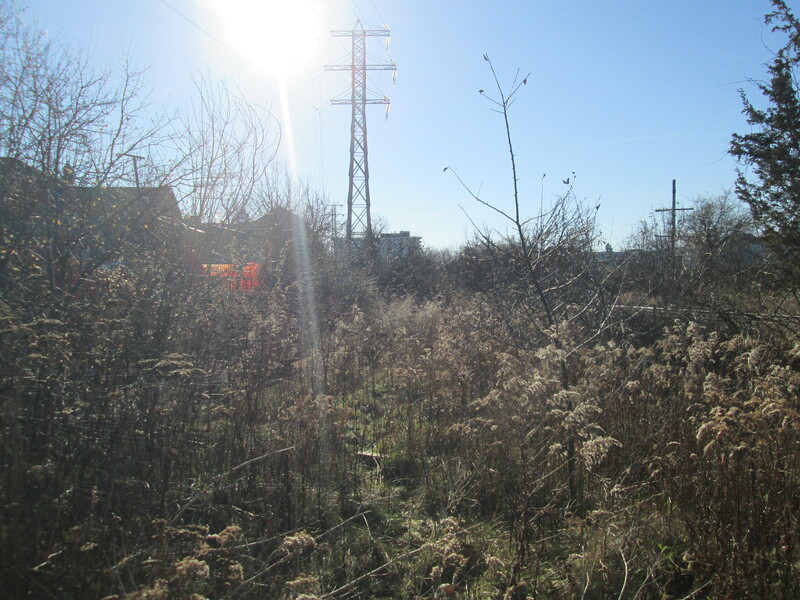 Today the junction of the CN’s track to Union Station is in the early stages of being reclaimed by plant life. 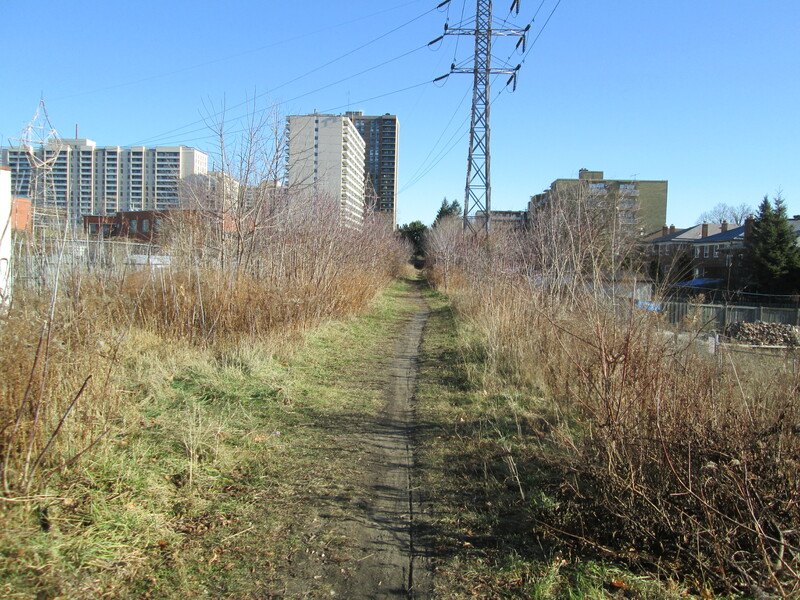 Another time we will explore the other two sections of the Beltline Railway trail system. 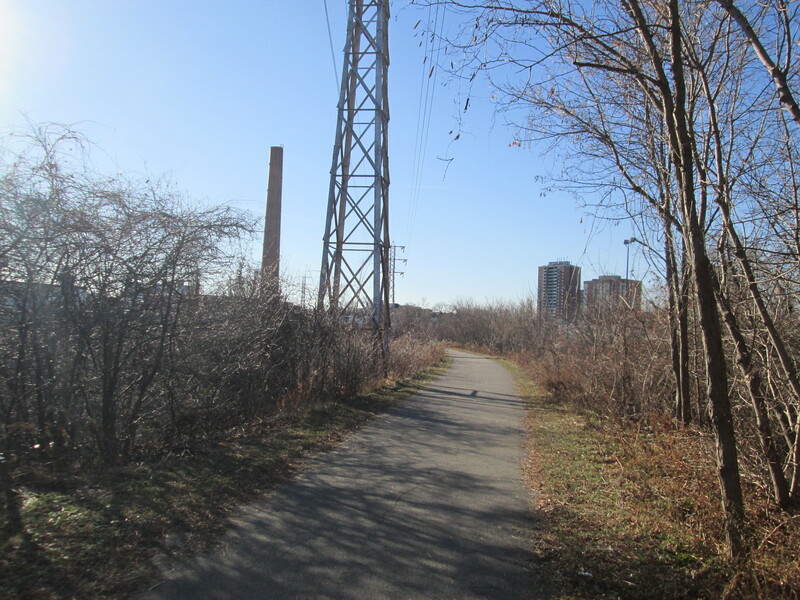 This entry was posted in Abandoned Rail Lines and tagged Belt Line Land Corporation, Belt Line Railway, Canada Goose, Dufferin Street rail bridge on December 10, 2014 by hikingthegta.